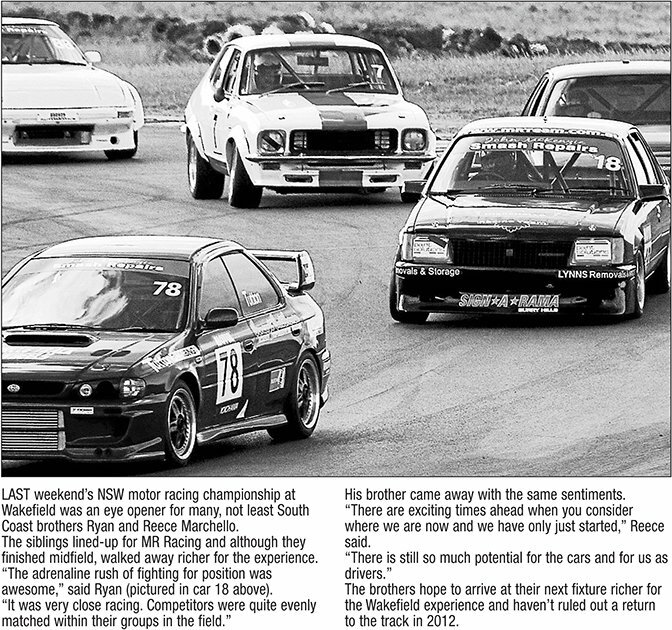 LAST weekend’s NSW motor racing championship at Wakefield was an eye opener for many, not least South Coast brothers Ryan and Reece Marchello. The siblings lined-up for MR Racing and although they finished midfield, walked away richer for the experience. “The adrenaline rush of fighting for position was awesome,” said Ryan (pictured in car 18 above). His brother came away with the same sentiments. “There are exciting times ahead when you consider where we are now and we have only just started,” Reece said. The brothers hope to arrive at their next fixture richer for the Wakefield experience and haven’t ruled out a return to the track in 2012.